The Eighth Edition of Contemporary Curriculum: In Thought and Action prepares readers to participate in the discussion of curriculum control and other matters important to K-12 and university educators. The text highlights major philosophies and principles, examines conflicting conceptions of curriculum, and provides the intellectual and technical tools educators and administrators need for constructing and implementing curriculum. 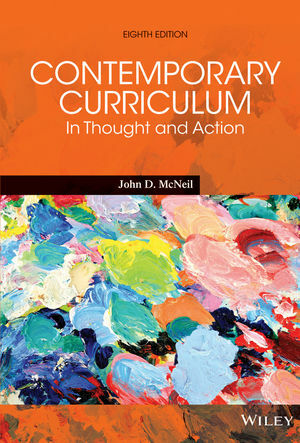 John D. McNeil is the author of Contemporary Curriculum: In Thought and Action, 8th Edition, published by Wiley. New content addressing the Common Core State Standards. Coverage on the departures in curriculum goals, sequence, and teaching methods in school subject matters, such as the change of literacy from traditional reading to reading of complex subject matter texts in order to learn. With the redefinition of national, state, and local responsibility for setting curriculum standards, accountability measures, and developing curriculum, Contemporary Curriculum offers help to schools and teachers as they take initiative to carry out their new role as curriculum developers. A new focus on technology featuring MOOCs, online course development, flipped classrooms, tablets, curriculum development and use of video games. With the Common Core and the rise in charter schools, Contemporary Curriculum offers a new focus on the politics of curriculum making and the mounting issue—public vs. privatization of schooling in the context of diversity and equity. Provides practical tools for doing curriculum at all levels: policy, institutional, and classroom. Contemporary Curriculum: In Thought and Action offers multiple strategies, along with explanations as to when, why, and how each tool applies in a given situation. Fosters interactive learning and a lively classroom experience using case openers for each Part, providing perspectives from varying orientations to curriculum, suggesting research strategies, illustrating the connection between curriculum and instruction, establishing a historical, psychological and philosophical foundation, and providing flexibility in the order of topics throughout the text.